About 10 years ago, we had a project with the Coast Guard that sent me up and down the coast and across the Pacific, looking at lighthouses, boat docks, airfields, and communication stations. Our job was to evaluate and research the environmental issues and past practices at each facility. It has been my favorite project to date as an environmental consultant. 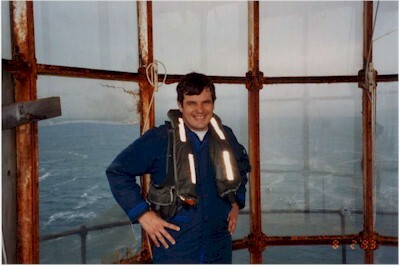 Here I am atop St. George Reef lighthouse, 7 miles off the coast of Crescent City, California. As the island is only accessible by helicopter basket, I was one of a handful people to visit the island in the past 25 years. After my visit, I was invited to dinner by the president of the lighthouse's preservation society, who had never visited the lighthouse. I was made an honorary, lifetime member of the society and received various souvenirs.